Transfer from Hanoi to Halong bay. Lunch after boarding. Cruise through thousand amazing islands and islets, visit Surprising Cave, kayaking, swimming, relax on boat at night. Overnight on boat. Morning, take a city tour. Visit the Re-Unification Palace, the Notre Dame Cathedral, the War Remains Museum, Jade Emperor Temple, Binh Tay market and Ben Thanh market. Afternoon, leave Ho Chi Minh for Cu Chi. Explore Cu Chi tunnel. Overnight in Ho Chi Minh. Leave Ho Chi Minh for My Tho and Ben Tre. Take a boat trip on mekong river to a family business which epitomizes the idyllic rural lifestyle, walking through the fruit plantation village. Overnight in Can Tho. Take a leisurely boat trip to explore the picturesque tributaries of the Lower Mekong river. 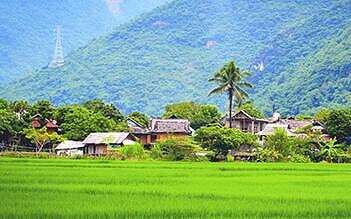 Proceed to Chau Doc, continue the tour to visit Tra Su, getting to the wild birds Sanctuary. Overnight in Chau Doc. Speed boat from Chau Doc, Vietnam to Phnom Penh, Cambodia. After a refrestment, visit Royal Palace, Silver Pagoda and National Museum. Overnight in Phnom Penh. Morning, transfer from Phnom Penh to Siem Reap. 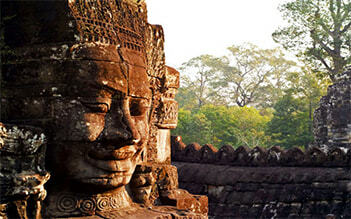 Afternoon, visit some famous temples in Siem Reap including: East Mebon, Ta Som, Neak Panan, Preah Khan, Pre Rup. Evening, enjoy buffet dinner and watch Khmer Traditional Dance Show at a local restaurant. (Alternative: Visit the notorious Choeung Ek Killing Fields & Wat Phnom in the morning. Afternoon transfer to Siem Reap. Morning, visit to the antique capital of Angkor Thom. Continue your visit to Ta Prohm. 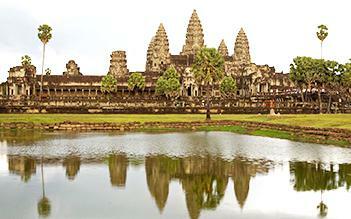 Afternoon, visit Angkor Wat the most famous of all the temples on the plain of Angkor. Enjoy a wonderful sunset scenery from the Top of Phnom Bakhen Hill. Overnight in Siem Reap. Love the trip I thought I just wanted to see Angkor Eat and Halong Bay. Every single day on this trip is a delight, a different experience every day. It's amazing! The Cambodia and Vietnam Experience is a very well organized trip hitting many major cities, including a few very cultural homestays and fun side trips. And there is some free time to get further off the beaten path which is important to me. I did find it difficult being the only American in the group as well as being the oldest woman. I didn’t know BRITs could be so cliquish but all the single English plus 2 Australian women were. There were two older British couples who became my best buddies. They were older but not quite as old as me. They were quite inclusive. I have found groups With more men, be they young or old, make it much more balanced.. So next time I’ll find out the group makeup before signing the contract, Aside from that the trip was wonderful and I can heartily recommend it.